The conversion to PDF/A has been improved and completely re-implemented. If a document can not be converted directly to PDF/A in the first step, there is also the possibility to render the document and create an image of the pages. The text is read from the source page and re-inserted into the target document without further OCR operation. 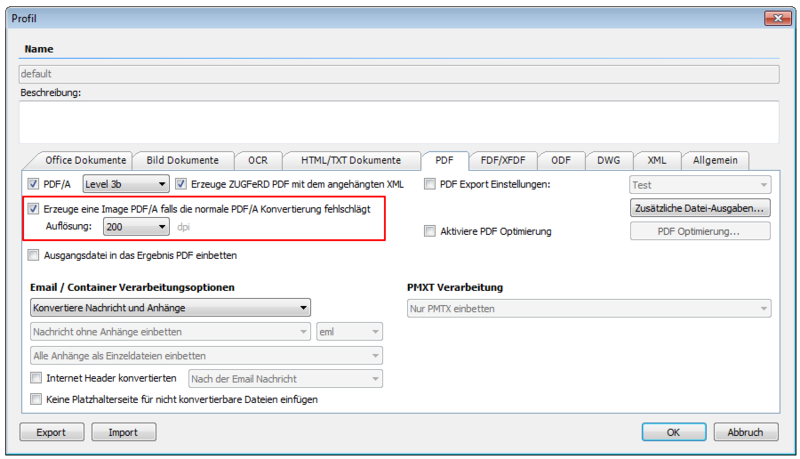 This makes it possible to create a valid PDF/A document from documents which are normally not convertible to PDF/A. This corresponds to the original with regard to its visual appearance, but also contains the text for the search. Normally, such documents would have to be printed and re-scanned. The software is now able to find out on which page an uncorrectable error occurs during PDF/A conversion. Thus, only those pages are “rendered” where a conversion error occurs and not the entire document. If the PDF/A output is selected, the “rendering” is now activated by default with 200dpi.